This is a fantastic read, really glad I got around to it! I've had Infomocracy on my list for a while now. The parallels with Palmer's Too Like The Lightning are surprisingly deep—Older's book is a much different read, and both the premise and time-setting more modest in comparison, but the big-idea, quasi-utopian politics, the quiet-but-huge tech advances, the slow and mostly irrational rumble of a peaceful world towards some kind of war—intriguing to put them side by side. But that's getting ahead of myself. 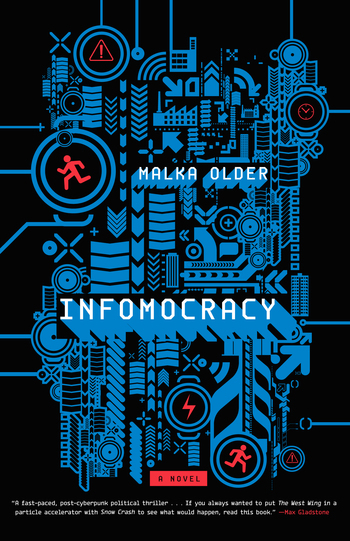 Infomocracy reads like a straight thriller, following two young activists/operatives in a near-future where the world has transitioned to "micro-democracy". Split into voting blocks of 100 thousand, people can now vote for a huge range of governments. Things are kept above-board by ubiquitous Information: an organization a bit like Google fused with Wikipedia and with a universal mandate. On the eve of an important election, with previous power blocs poised to tumble and rearrange, Mishima, Ken, and a handful of other characters are caught up in a complicated plot to subvert the voting process. Older has a cracking plot here, and keeps the pacing fast without being relentless. It took me a few chapters to acclimatize—she throws a lot of character, world-and-plot complexity at you very quickly—but then it's off to the races. I admit to being a bit of a sucker for the well-done simple meet cute: Mishima & Ken are fleshed out a tiny bit interesting, they run into each other and sparks fly, plot gets complicated but you stay interested in their relationship. It's a good bit of dynamo, and doesn't really get in the way of their separate-but-somewhat-overlapping goals. The one critique I would offer on the book is that the secondary point-of-view characters don't add much; personally I find something a little odd in the reading experience when the multiple points of view aren't balanced. The worldbuilding here is tactfully done: there's enough interesting to make it's half-a-century-on setting believable, but it's not overly caught up in the whiz-bang tech or the global warming effects. There's hints of both—other than the central governmental premise, the relatively mild IT and climate developments are maybe the biggest disbelief-stretchers—but they're also not central. I did really enjoy that Older goes out of her way to set up non-gun-based action scenes—a bit of tech that is perhaps a bit more believable than Dune-style shields, but in the same spirit of "keep fun hi-tech stuff, but also swordfights". For all the big ideas, cyberpunky tech, and globe-trotting action, something about the nitty-gritty of the bureaucratic/organizational action here feels very grounded. Not that surprising, perhaps, after reading Older's author bio. One doesn't have to be an "election nerd" to get into this—if anything, I was a bit surprised that the novel doesn't get into voting mechanics—but the feeling of the Information and Policy1st crowds as they drill into projects felt very real, as did the drinking as the election results came through. A really fun read, and one that manages to feel both timely and likely to remain relevant. I'm definitely planning on reading the rest of the trilogy—I should note that this doesn't cliffhanger, if you're worried about that. Found myself thinking of Kim Stanley Robinson, Ada Palmer, Cory Doctorow & Annalee Newitz—though it really doesn't read much like any of them stylistically. Highly recommended.